Saturday evening, I took Diana for a ride through Wild Cherry Resort on the golf cart, as she had not seen the outer reaches of the property. 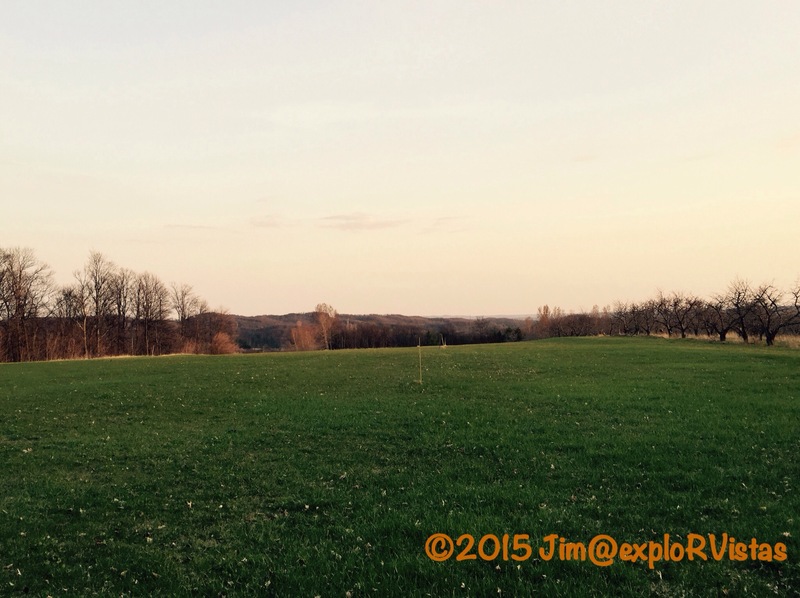 Towards the back of the golf driving range, we discovered a sea of wildflowers blooming. 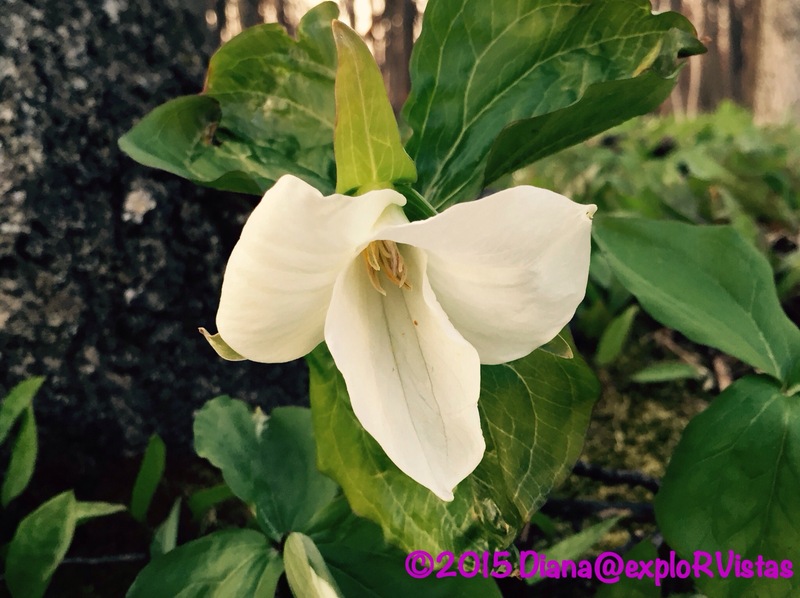 We saw this trillium, one of the first to open. There are hundreds more that are ready to go. The Dutchman’s Breeches were everywhere. Notice how they look like they are hanging on a clothes line. While the trees have yet to show their leaves, the weather is outstanding! From the back of the range, you can literally see for miles. This vista is looking to the south. 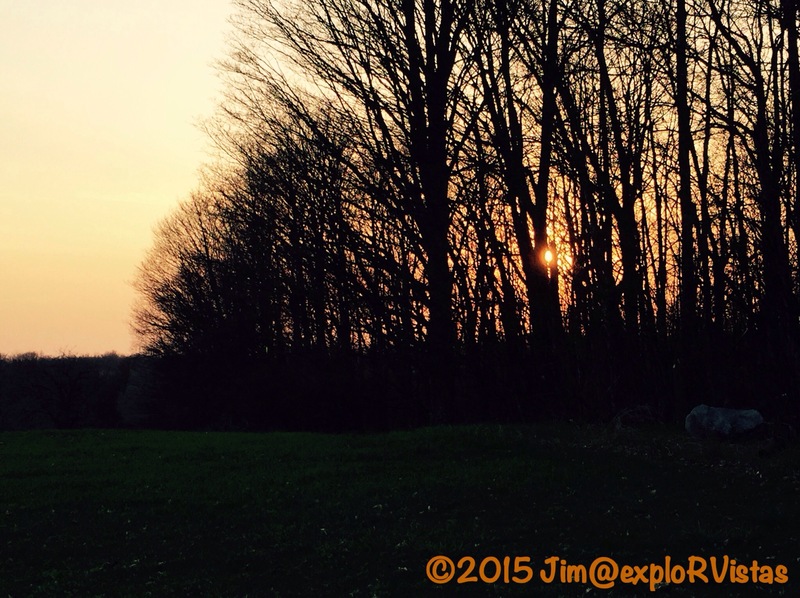 The setting sun in the leafless trees is a mid-spring treat in Northern Michigan! Afterwards, we drove down into the lower woods and checked out the tent sites and the yurt. Along the way, we spied more flowers. I am fairly certain that this is Bloodroot that has not fully opened. We headed back up to the office to drop off the cart. 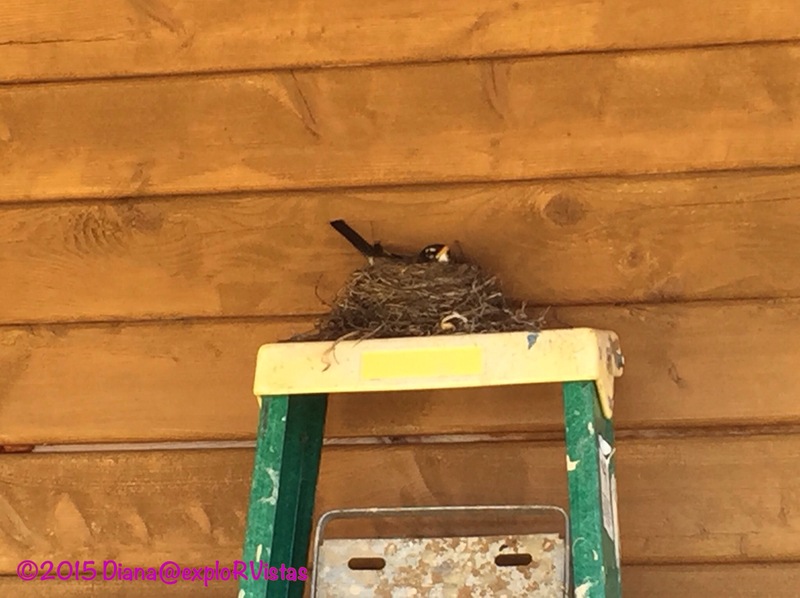 We have to be careful pulling into the cart storage, as a robin has found a nice place to build her nest. Good thing the resort owns more than one ladder! Momma robin has 4 eggs in there. 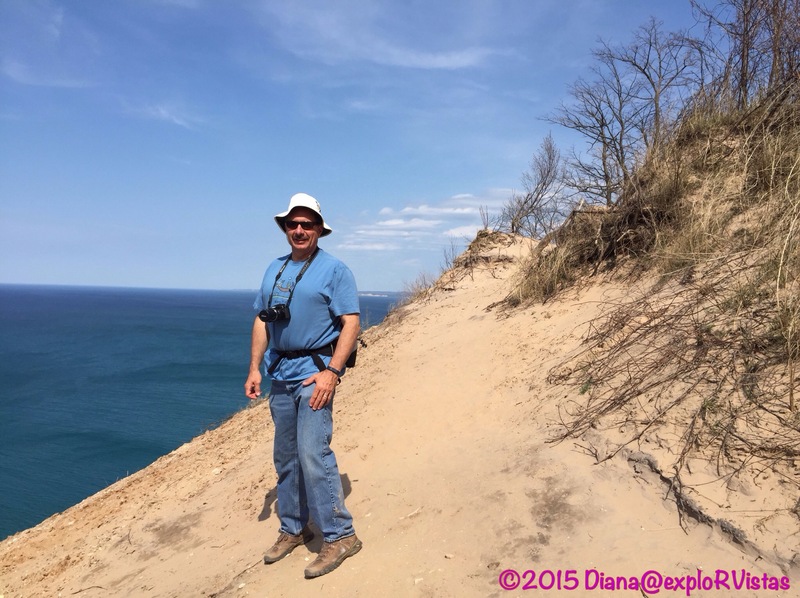 On Sunday, Diana and I took a drive down the Lake Michigan shore to the town of Empire. 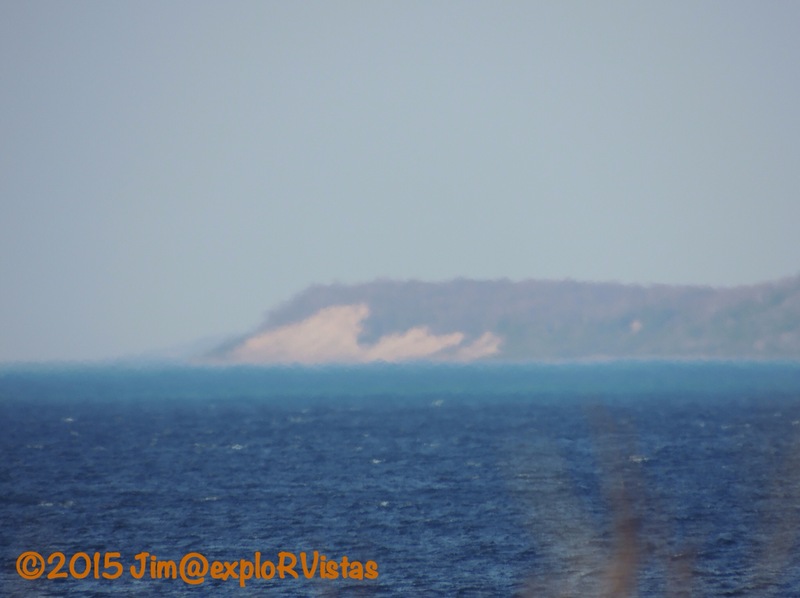 That is where the visitor’s center is for Sleeping Bear Dunes National Lakeshore. We were in need of our annual All-Access Pass, which gets the two of us into any national park for the next year. At $80, we feel it is an amazing bargain. After securing our pass, we headed back up the shore to our destination for the day: Pyramid Point. 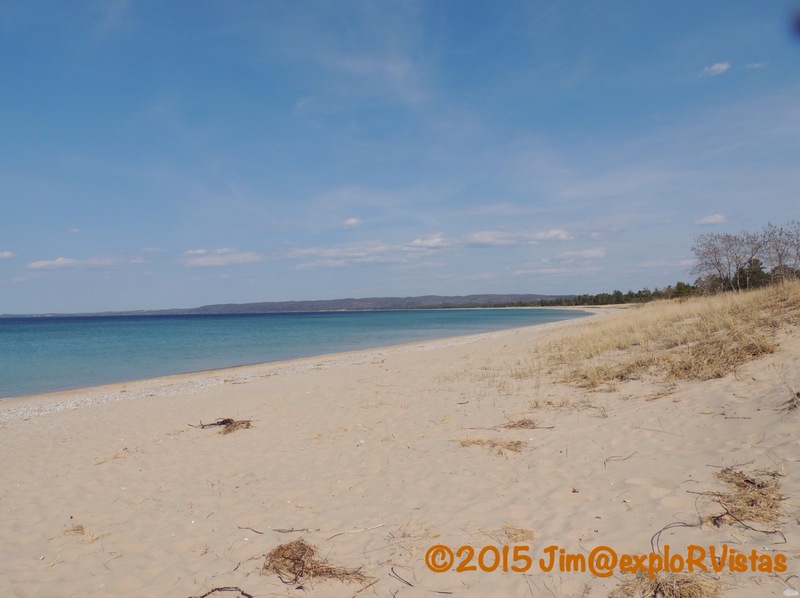 This particular dune forms the western arm of Good Harbor Bay. 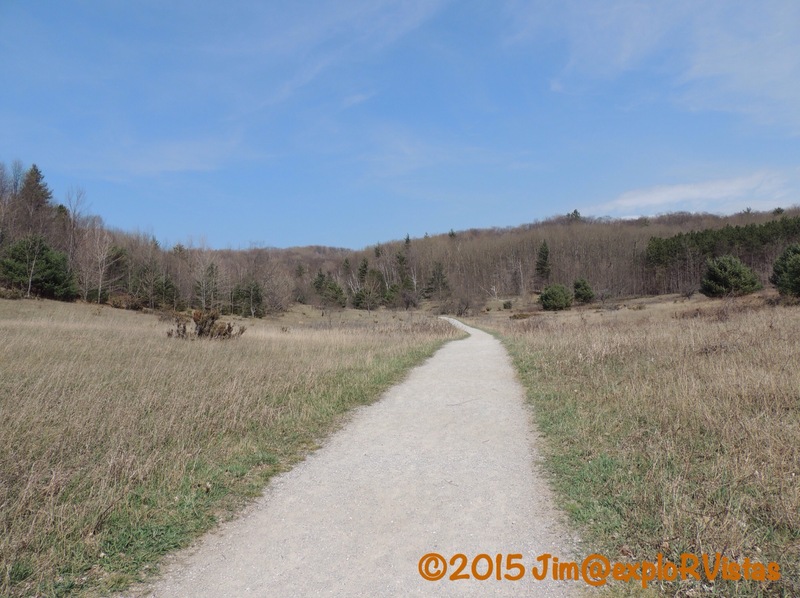 The 1 mile crushed gravel trail starts out fairly level through a grassy plain. 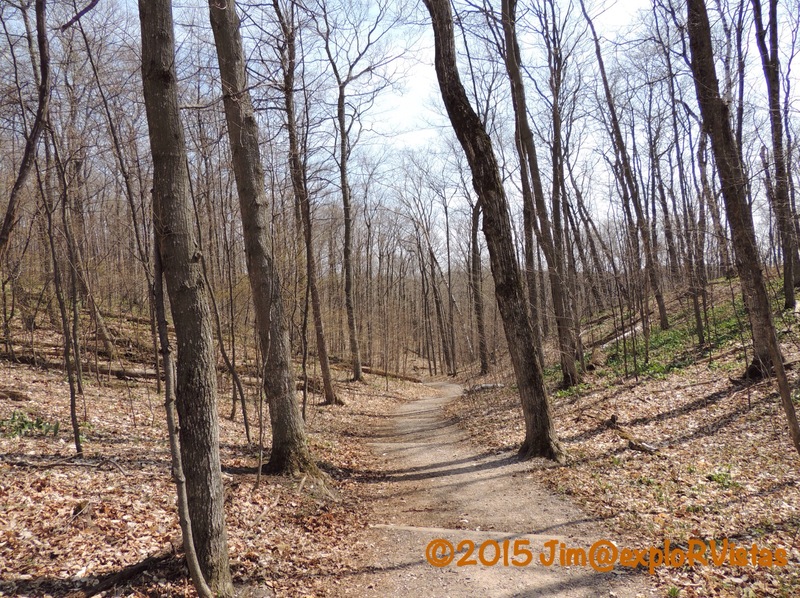 Further into the woods, the trail steepens. This photo is deceiving, as the temperature was 79 degrees! 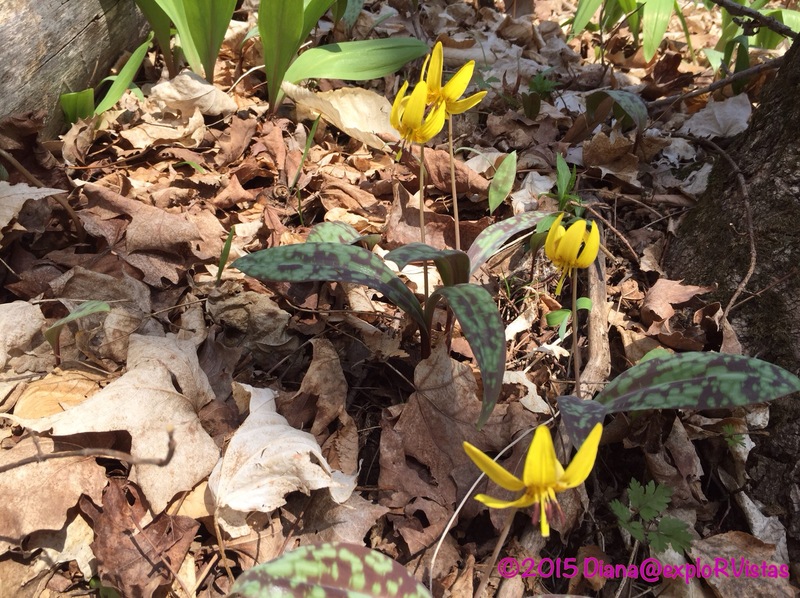 Diana spotted Yellow Trout Lily blooming along the trail. 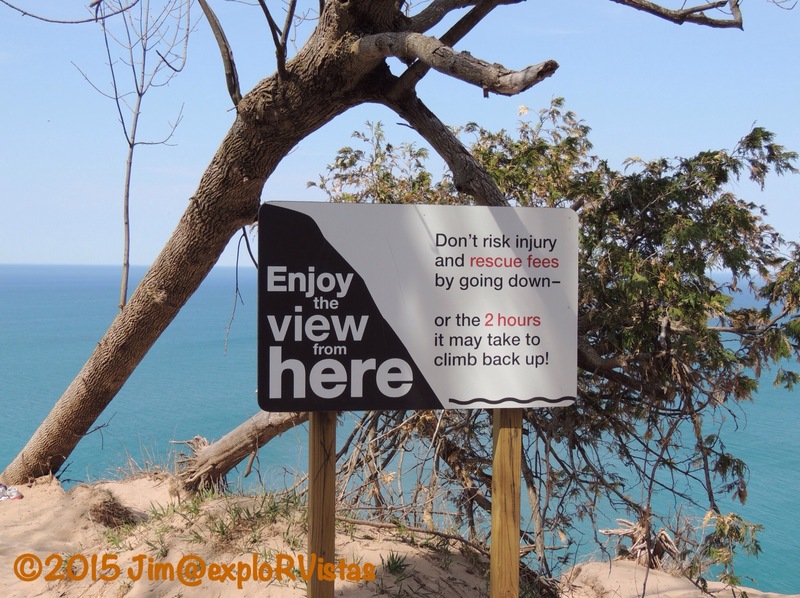 Once at the top, this sign gave ample warning as to what lay ahead…. Per my iPhone compass, we were 420 feet above the surface of the lake. 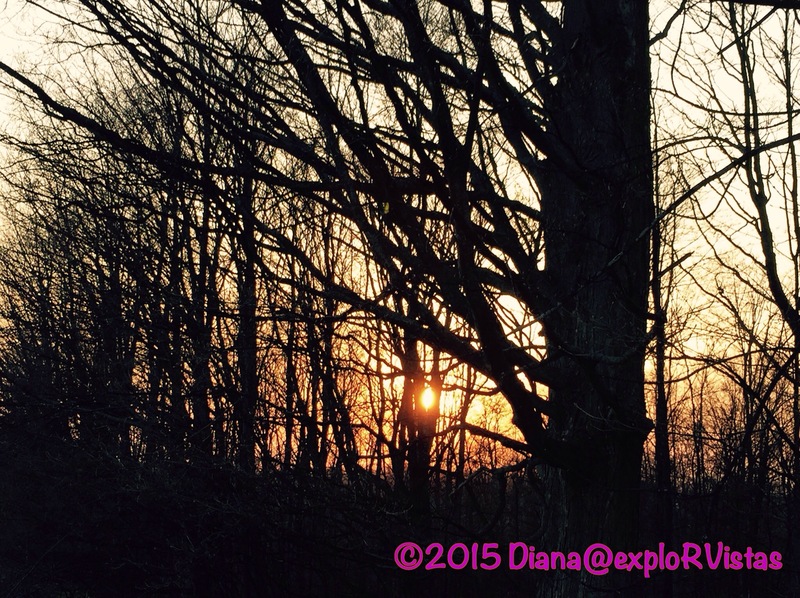 Diana found some firm footing for a photo…. While we were there, the Philip R. Clarke steamed by. This ship is a sister and fleetmate to the Arthur M. Anderson, which was the ship that was following the Edmund Fitzgerald when it sank in Lake Superior. 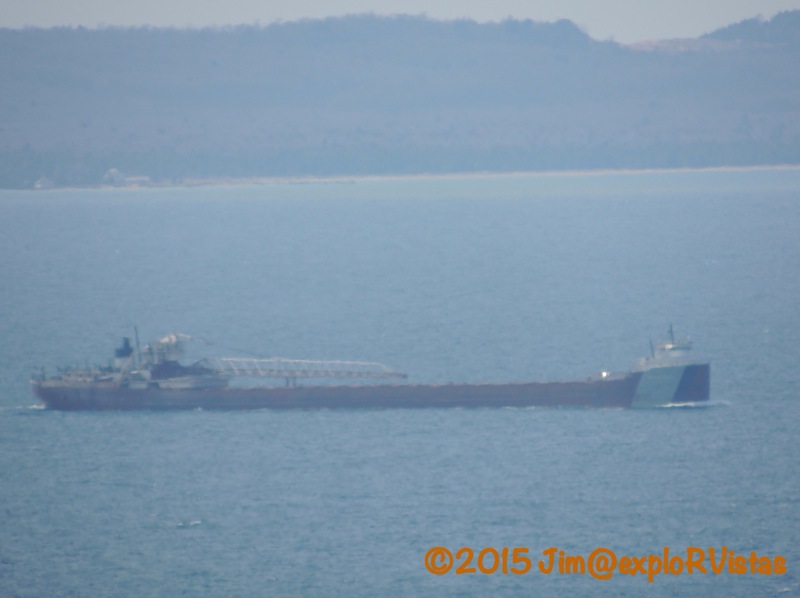 Both ships are 767 feet long and can haul 25,300 pounds of cargo. We are able to follow ship passages on the Great Lakes Seaway and Shipping website, making vessel identification a breeze. This area also is home to many shipwrecks, and there are several lighthouses that aid in navigating the waters. 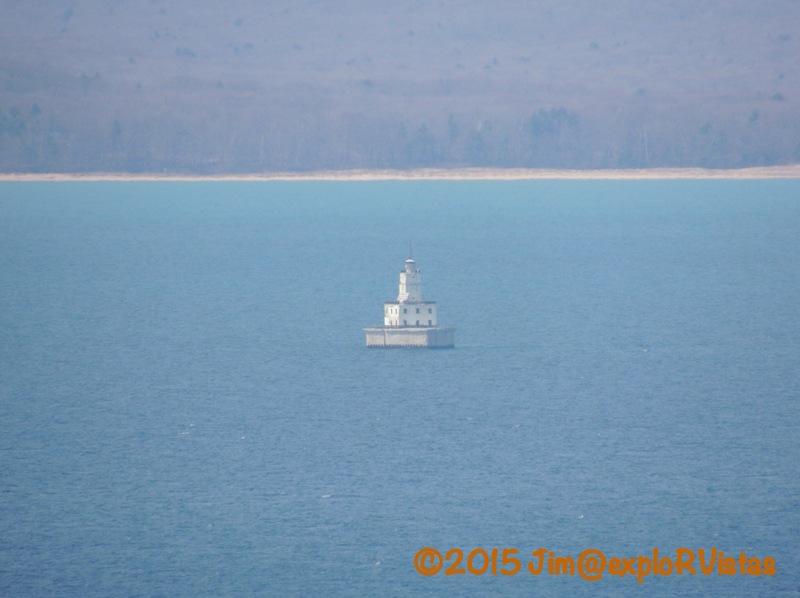 Here is the Manitou Passage Crib Lighthouse…. 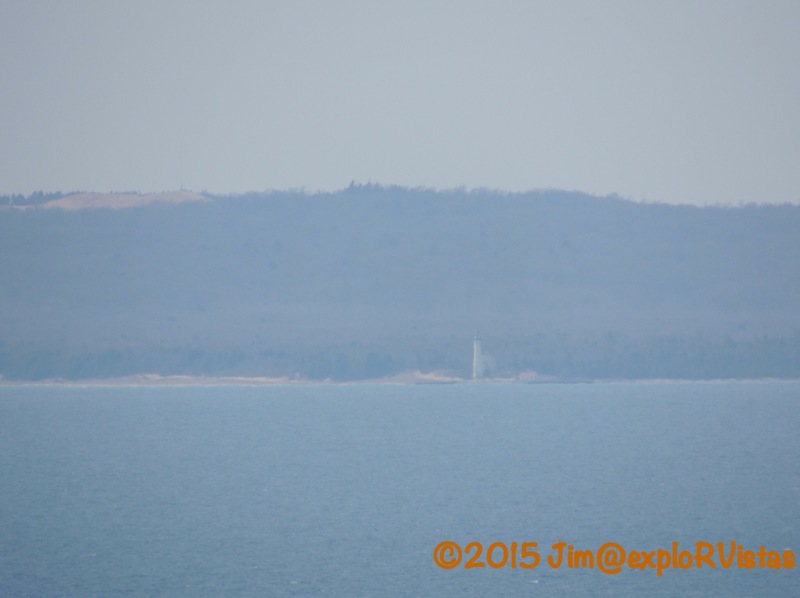 …and the South Manitou Lighthouse further in the distance. We hope to further explore this sentinal later this summer. After leaving Pyramid Point, we headed east along the shore to the beach at the end of Bohemian Road on Good Harbor Bay. This is a wide, sweeping bay that faces due north. 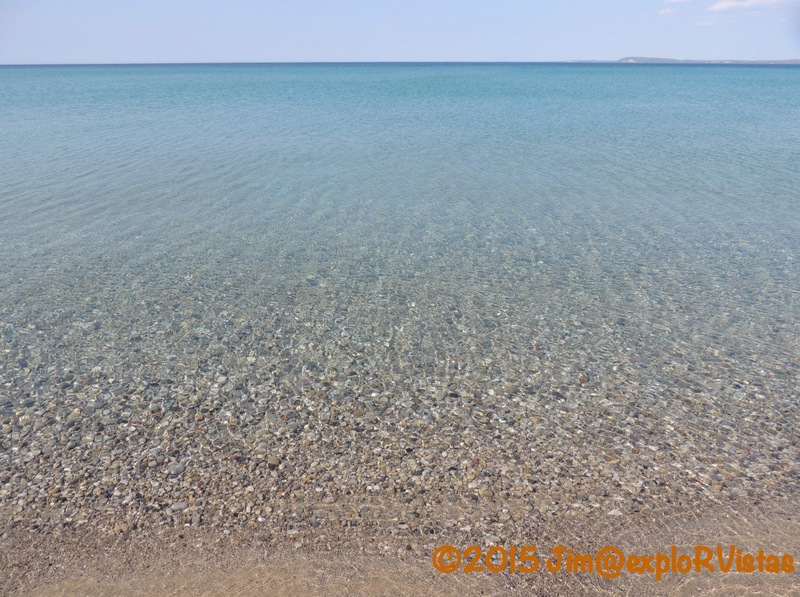 Even with the prevailing southwest winds clocking in at 30 miles an hour on Sunday, the water at the shore was dead calm….hence the name “Good Harbor”. The rocks extend a few feet and then the bottom is sandy. As you can see in this distance shot, the water was a bit choppier farther out. 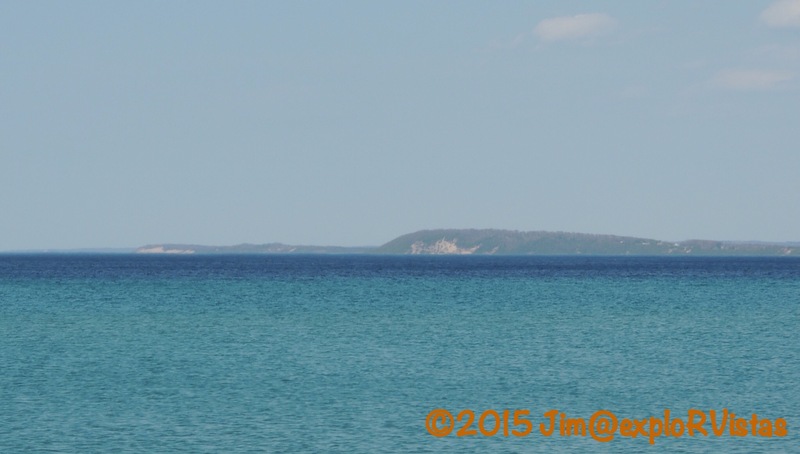 From this point, we were able to see northward along the western shore of the Leelanau Penninsula. The town of Leland is up along there somewhere. That is where we saw the sunset from the other night in our previous post. For the first few days of May in this area, the weather has been marvelous. 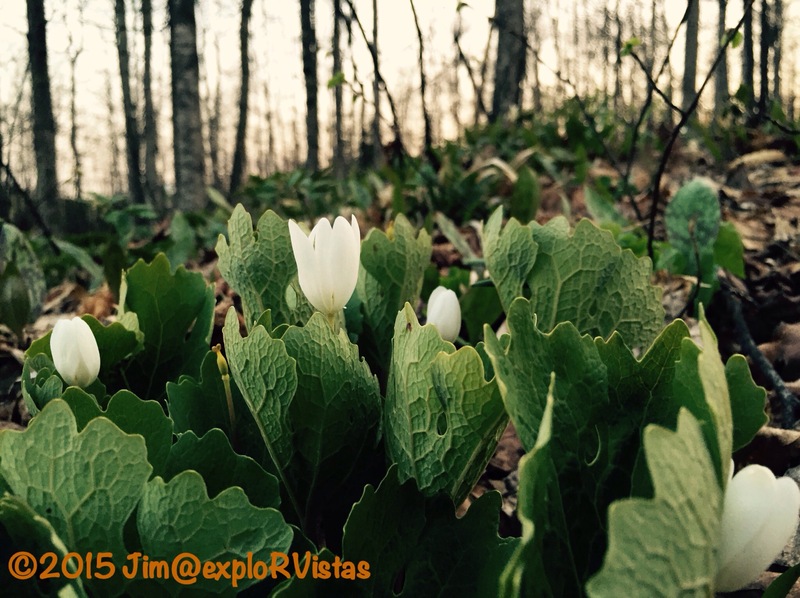 As the wildflowers have announced, Spring has definitely arrived in Leelanau County! Looks really nice up there. In addition to the flowers blooming, I cannot help but think of ticks and mosquitos. Hopefully they will not be too bad this year. We too purchases the National Parks pass, definitely worth it!!!!!!! With the peninsula being mostly sand, things stay fairly dry. We’ll keep an eye out for bugs! Beautiful pics!!! 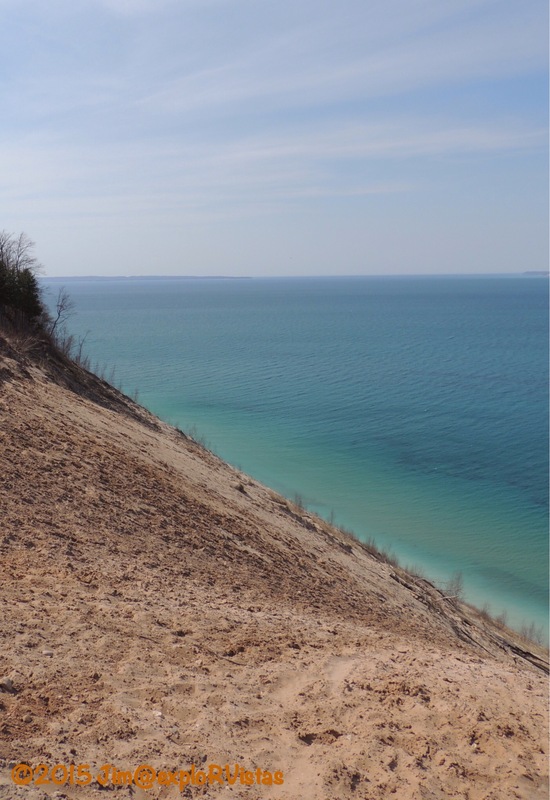 Michigan is an area we can’t wait to explore. Nobody deserves Spring more than you guys this year😉. ENJOY !!!!! Thanks, Michele! Diana was just mentioning how much you and Peg seem to be enjoying your work camping jobs! Sure is fun! Photos never seem to capture the height of those dunes. I wondered how long it would take someone to climb back up. Wow, it is so beautiful there. Great photos! 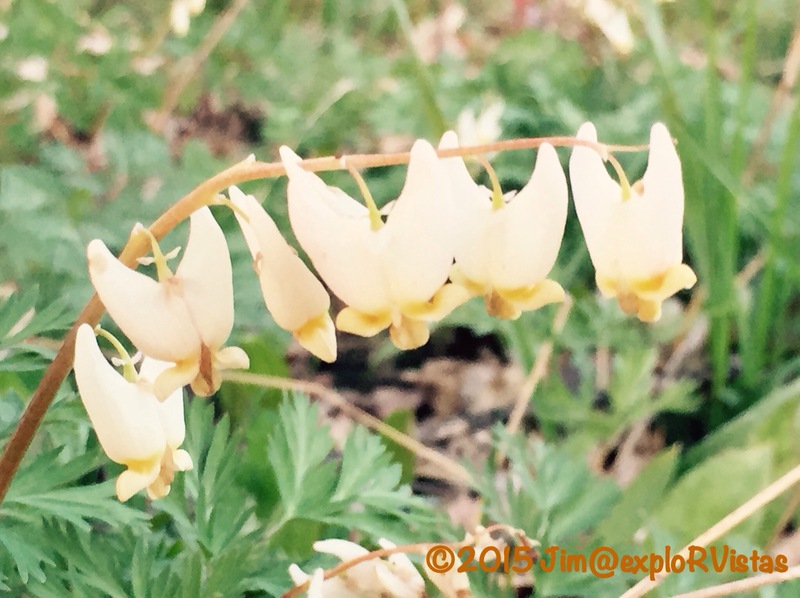 Love your wildflower photos and good job identifying them! Love the pictures on top of the sand dune. It really is a long, long, way down! Karen made it to Michigan to see family last night. She is actually staying in Howell with her mom. She wants to go fulltime now so we can spend some time up there in her old stomping grounds of Michigan. Think I’ll forward her a link to your post. Your photos were wonderful. Felt like I was there as you took them. Best of luck in moving up your dreams, Mark! Thanks for the compliment! I’m really surprised to see a different vegetation growing over there. The Dutchman’s Breeches look so cute ! Nice hike with the pretty flowers. Did you guys hike down to the water on that steep slope? I would’ve liked to but it was raining and cold when we were there. Pretty place. Did you guys come up here when you picked up your Montana? I’ll bet his knees were crying a different story the next day! We camped there in the late summer last year while heading east. Such a pretty area. We loved kayaking down the river to the lake too! And I have to say the beach at Pyramid Point is beautiful! How come I’m following your feed but I didn’t see this post? Hmmmm….. I had a reader who said the same about mine and I didn’t know what I was doing wrong (still don’t know) But I see I have to check yours manually. Anyway…. Lovely photos and looks to be a lovely place to spend the summer. Cool to be so close to the Great Lakes — any of them. 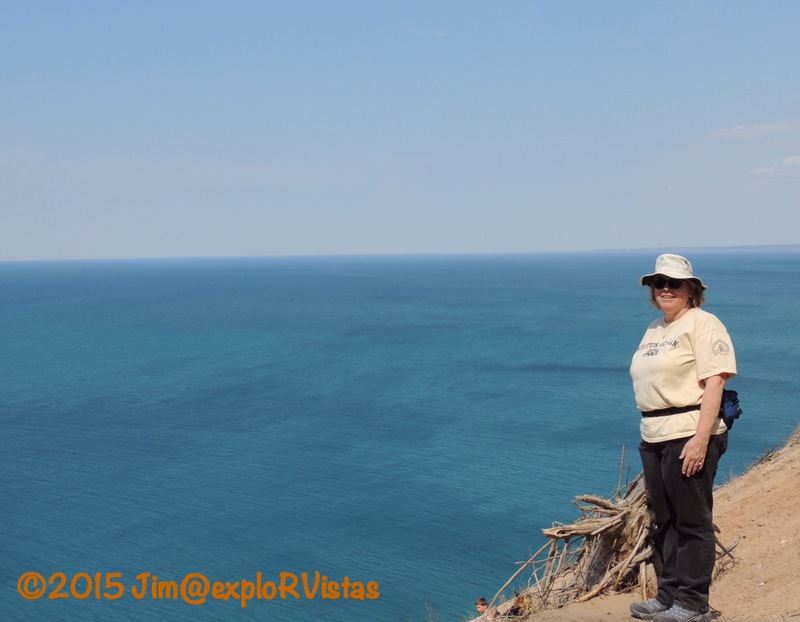 We were on Lake Michigan for most of 45 years. Loved being able to walk the shoreline; really miss it now — still. Not sure what is happening with the feed. I have a few blogs that happens to, but not yours. I’ll check my settings. Don’t even get me started on Microclimates! We lived 3 blocks from one of the biggest County Parks in Milwaukee and there was a lovely, paved path that we often walked. Being on the edge of the bluffs along the lake cold drafts came up the valleys and you’d be out there walking in the middle of summer with temps in the 90’s and all of a sudden you were down on the low 80’s and even in the 70’s — it was bizarre. And that was all in a couple mile long distance — and there was one spot that you could drop 25º for a space of about 1 block and then back up — strange. So I can appreciate what you’re going through. I don’t think there’s anything you can do about the feeds. I did a service ticket with WordPress and got a bunch of mumbley nonsense. They do drop blogs with over 15 categories — they consider that spamming — that I didn’t do that and neither do you. Thanks for the tip…I am up to 10 categories. I wish WordPress had better customer support. I may end up purchasing WordPress for Dummies, just to get some clarity. They drop individual posts from the feed — so they say — if the individual post USES more than 15 categories in a single post. So they say. There was a lot of conversation back and forth about whether it’s ‘categories’ or WORDS in the categories and that’s where it got a little dicey. I’m not sure the person responding actually understood the workings of the algorithm that did what they were trying to claim. If you learn anything definitive, let me know. I wasn’t that interested. Just reduced my use of categories. I’m lazy.